Set beneath wide open blue skies and in the shadow of mountains, following the path of mighty rivers, heated by volcanoes and cooled by glaciers; in the long, lazy days of summer and in the snow-filled winters, the North Thompson Valley’s natural history reads like an action-thriller. The drama unfolds in our hinterland — born of shifting tectonic plates and on-going eruptions of rock, fire, and ice. Three mountain ranges cover this place; rustic badlands and soft, rolling mountains in the lower North Thompson slowly begin to careen upward the further north you travel. Eventually, at the doorstep of the Rockies, the three mountain ranges collide, their jagged peaks piercing the bluebird sky. Along the way, a lush and aromatic inland rainforest holds secrets of its own: storied waterfalls — the kind romantics are always seeking, volcano fields and lava beds, and fresh-water lakes fed by ancient, receding glaciers. 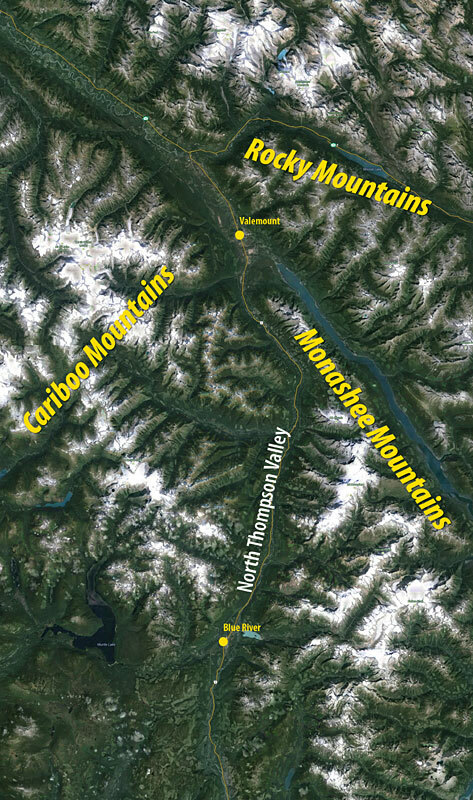 Binding the fabled landscapes together — the ever mighty Fraser, North Thompson and South Thompson rivers. Travel the legendary Yellowhead Highway 5 north from Kamloops and look beyond your windshield. You may only notice the sweeping and stately beauty of the Monashee, Cariboo and Rocky Mountain ranges passing by, but, layered deep in their weathered and rocky slopes, is the creation story of British Columbia. Imagine the Earth eons ago, before the history books were written. Once a large super-continent known as Pangaea, the Earth’s surface separated into smaller land masses, eventually drifting apart. Constantly in motion, even at the break-neck speed of fingernails growing, the North American Plate collided with the Pacific Plate Terrane, some 175 million years ago. The force of this impact was so great that it forever changed the landscape, creating the striking Columbia Mountains. Over time huge masses of rock began to fracture and slide over one another, forming the even-more magnificent Rocky Mountain range. These ranges as we know them today sit like weather-beaten soldiers with a hidden tale woven within their rocks. The next chapter in the North Thompson Valley’s natural history thriller takes place some 10,000 years ago when fire and ice both left their mark on Wells Gray Provincial Park. Lava beds, tuyas, crater lakes and cinder cones are all that remain today, but if you look closely as you explore the waterfalls, rivers, and hiking trails you can begin to piece the story together. Four separate glacial periods iced-over this wilderness region, all the while, bubbling beneath the frozen mantle of the Earth’s crust was seething, hot magma just waiting to explode. And when the churning hot molten mass would eventually escape its icy realm, hot air would travel up the surface causing violent steam explosions and fragmented rock pieces to cool by flowing over the ice. Successive explosions created the layer-cake landscapes you see all throughout the Park. Eventually, receding glaciers carved gaping canyons and flowing rivers through the valley. Where scorching lava once scarred, icy glacial waters now plummet with some of the most extraordinary waterfalls in the world. Today, this area is magical, with hardened volcanic rock layers, lichen-drenched boulders sitting in the mist of surging waterfalls, and lush, forested corridors. There are plenty of ways for you to explore the natural history of the North Thompson Valley’s mountain playground: Take in the views of the majestic Rockies, layered in sedimentary rock and marine fossils. 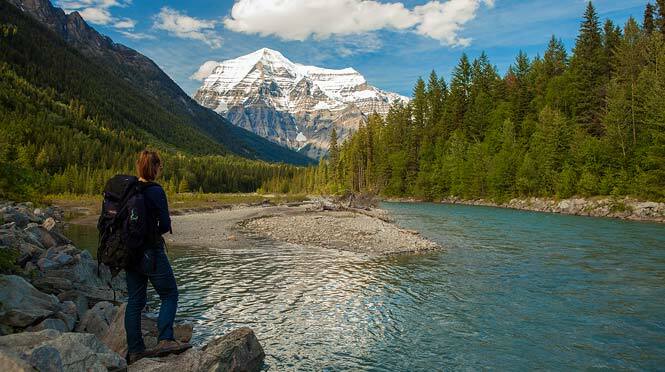 Helicopter to Berg Lake located near the top of the highest peak of the Canadian Rockies, at Mount Robson, and walk the frosty shores of this glacial wonder. Hike Tod Mountain, through an abundance of blossoming alpine colour, backcountry wildlife your companion. Climb the observation tower at Cranberry Marsh and view where the Monashee, Cariboo and Rocky Mountains all meet, or canoe among the 140 species of birds that migrate through the area. Fly fish from atop a lava bed! The crusty rock outcrops above Clearwater Lake’s Osprey Falls was once molten lava. See if you can count the layers of rock, each representing their own volcanic eruption at Helmcken Falls, or Spahats Falls in Wells Gray Provincial Park. Float calmly in serene waters on the Fraser River or roll through the rapids on the Clearwater or Adams Rivers. Find your peace on Murtle Lake; North America’s largest paddle only lake and marvel in the watery wilderness surrounding you. Uncover your adventure in a land where geological shifting millions of years ago created our rough country paradise.